Plum Grove Baptist Church of Tuscaloosa hosted more than 200 people for a Healthy Eating Expo on Aug. 11. 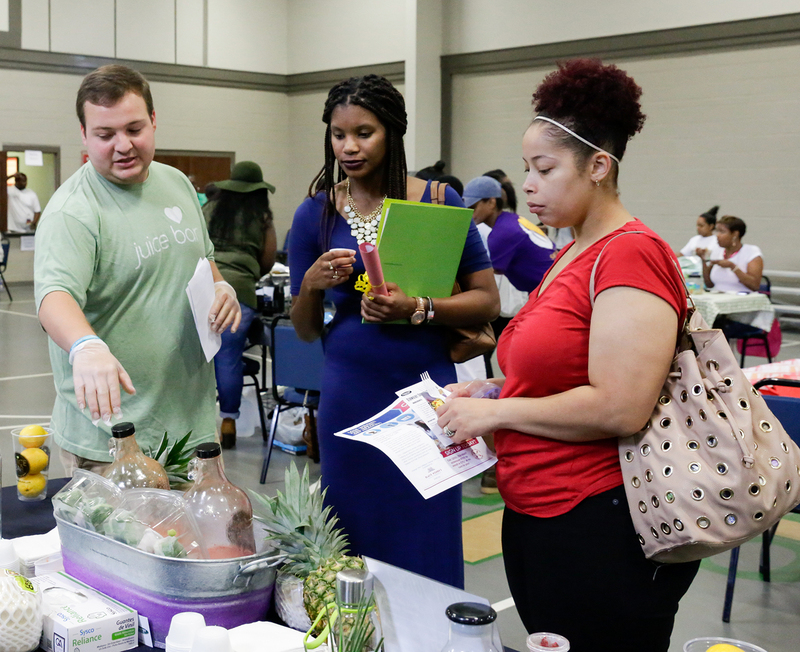 The project grew out of the church’s ongoing efforts to educate its members on health disparities and making healthy choices. 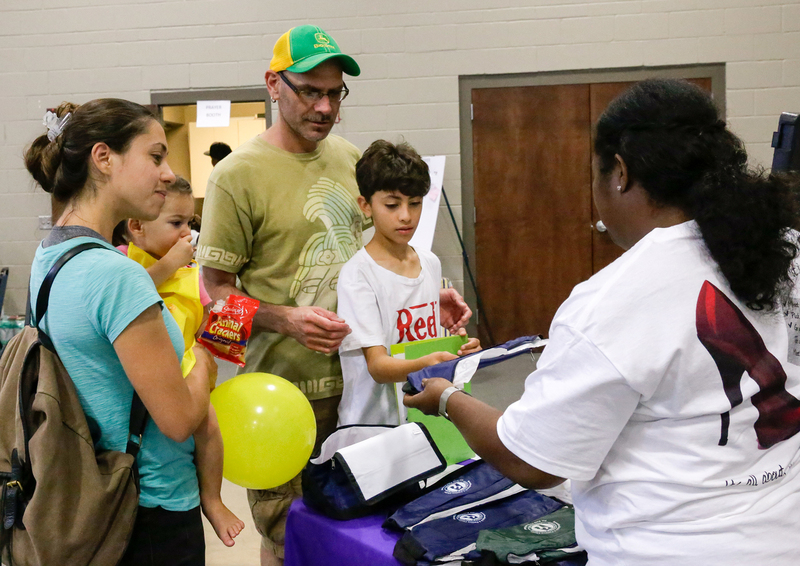 “It’s indescribable that what began as a very embryonic effort to be informative to church members has morphed into serious and really impactful community outreach,” said the Rev. Tyshawn Gardner, pastor of Plum Grove. Gardner is referring to his church’s decision to become a founding partner in what today is The University of Alabama’s Saving Lives Initiative, the brainchild of UA Community Affairs Vice President Dr. Samory T. Pruitt. The initiative began in 2012 and is implemented by the Division’s Center for Community-Based Partnerships (CCBP). Saving Lives works to reduce health disparities by encouraging churches to discuss health issues while providing educational resources and coaching to help them incorporate health information into their existing outreach and spiritual activities. In the process, Saving Lives has been transformed into an effective tool for sharing information to spread knowledge, truly saving lives, according to UA and community leaders. Under Dr. Nicole B. Prewitt, CCBP’s director of programs and partnerships for Community Engagement, Saving Lives has evolved from providing health-related curricula for Bible study groups to the creation of a leadership academy, which empowers members in small groups to initiate new programs within their church with the purpose of training members to take responsibility for their own health and their families’ health. During the free Saturday event at Plum Grove, more than two dozen vendors performed live cooking demonstrations, provided healthy recipes and samples, and conducted an aerobics training demonstration. A registered dietitian and physician were also present to provide advice. There was also a kids’ kitchen and prayer booth and prayer wall. 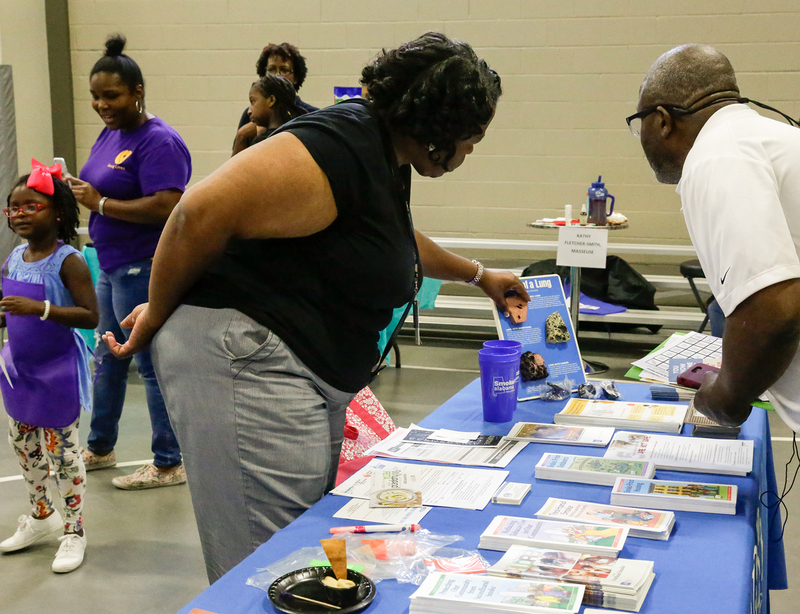 The Expo was coordinated by Plum Grove members Javelin Lewis and Shaunta Sanders, who serve as Saving Lives advocates. “I like being able to help people,” said Lewis, explaining why she decided to participate in the advocate training program. Then to see these efforts result in “people actually putting forth some effort and watch what they eat … was exciting,” she said. Lewis said planning the event allowed the advocates to combine the three Saving Lives components — physical activity, health information, and nutrition — with the church’s mission of spiritual outreach. She said the church hoped to expose the community to healthy options, while simultaneously providing health care information related to diabetes, high blood pressure, smoking, obesity, HIV and more. “There are so many alternatives to frying and to seasoning and the food is good and healthy for you,” Lewis said. Team member Sanders is a nursing student at the University of West Alabama. She said what she learned during the Expo supported what she is learning in nursing school and helped her develop a connection between health and care giving. Sanders said she knew the Expo would draw a crowd to the church. “I thought we might have too many people. Everybody loves to eat,” she said. Gardner said he is proud to have his church participate in such a dynamic initiative. Saving Lives is under the direction of Dr. Nicole B. Prewitt, director of programs and partnerships for community engagement in the Center for Community-Based Partnerships, an initiative of the Division of Community Affairs. To learn more about the program, email nbprewitt@ua.edu or call 205-348-9819.